This roasted rutabaga (swede) dish is a wonderful addition to your dinner table. Sweet and fragrant with an earthy note, this side dish will have guest begging for the recipe. Just be sure to cook this for long enough to get the good caramelly bits. Rutabaga is a yellow brown root vegetable that is part of the cabbage family. It is a very underused vegetable, possibly because it looks pretty ugly in the shops, and people are worried about peeling and preparing it. It is called swede in many parts of the world, but the term rutabaga is unique to the US. Rutabaga can be boiled, steamed or roasted. Here we are roasting it with maple syrup to give it a wonderful sweet edge. Check out my Cheesy Rutabaga and Carrot Casserole for how to boil rutabaga. What is the difference between Turnip and Rutabaga? Although they are similar, turnips have a slightly more bitter flavour. You could use turnip in this recipe, but the flavor will be quite different. Rutabaga is a really healthy alternative to potatoes. When roasted they are crispy on the outside and fluffy inside like a roast potato but with significantly lower carbs. This roasted rutabaga dish is pretty special. We all know I love roasted veg!!!! If I can roast it, then I will!!! And I haven’t found a vegetable that isn’t delicious when roasted. In fact many vegetables taste better roasted! Take my roasted broccoli dish. Honestly it is amazing. And my roasted Brussels sprouts with fish sauce vinaigrette have been know to convert non-sprout eaters!!!!! If you love roasted veg as much as I do, then check out my roasted veg recipe collection, full of delicious ways to cook your 5 a day. I served this roasted rutabaga up with a steak and side salad, but they would be fabulous as part of a roast, or along side a grilled chicken dish. Please use really maple syrup here, flavoured syrups won’t give you the wonderful flavor or sticky crispy finish. 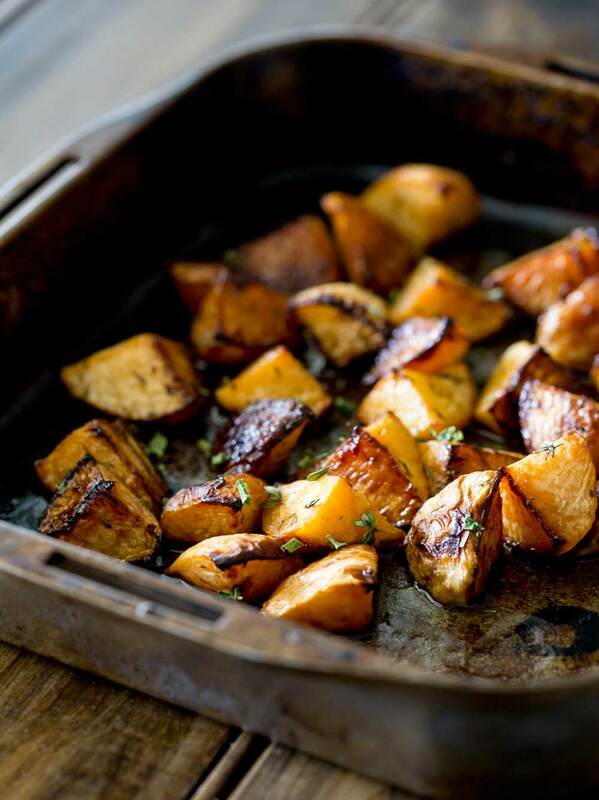 Pin these Roasted Rutabaga with Maple Syrup for later. Pin it here. 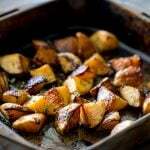 This roasted rutabaga (roasted swede) dish is a wonderful addition to your dinner table. Sweet and fragrant with an earthy note, this side dish will have guest begging for the recipe. Just be sure to cook this for long enough to get the good caramelly bits. Pre-heat the oven to 200ºC/390ºF. Place a roasting tin the oven to heat up. Peel the swedes and cut them into large chunks. Place the swedes in a and dress with the olive oil, maple syrup and dried thyme. Add in a good sprinkle of salt and pepper and toss to combine well. Spoon the swede into the roasting tin, reserving any dressing that has pooled at the bottom of the bowl. Roast in the oven, for 25 minutes, then drizzle over the reserved dressing and cook for a further 15-20 minutes until crisp and golden. Use real maple syrup here, the flavored syrups burn quickly and don’t have the depth of flavor you need. This roasted rutabaga was originally posted in 2016. But has been updated with new pictures, dual measurements and nutritional information. I have a beautiful reader called Dorothy, she and I have become friends. We have so much in common, amongst them is a love of cocktails and seafood!!!! Anyway, Dorothy is my American interpreter 😉 If I am unsure of anything then I check with her. The international language of food isn’t always clear cut. I am pretty lucky as when I moved to Australia I had to adopt the words capsicum, zucchini and eggplant (I am sure there are plenty more!!!!) so my food language has evolved. Add to that my obsession love of the cookery channel and the plethora of US cook shows, I am pretty well versed in arugula, cilantro etc. But I still like to check things with Dorothy. I’m super excited I found your recipe. My daughter gets fresh vegetables delivered to our home and it’s always a surprise what’s in the box. We have never eaten rutabaga before and I never knew it was called Swede. Your recipe sounds delicious I’m looking forward to making it. We love roasting vegetables. Maple syrup is a huge plus . Thank you for sharing and God Bless. Oh Carmela, thank you so much for taking the time to reply. I love the food delivery boxes as they introduce people to such delicious ingredients. I hope you and your daughter enjoyed the rutabaga. We call them rutabaga here in Canada too. I have never heard them called a swede. Love them! I’ve never tried them roasted before – only boiled and mashed or parboiled then finished in a quick sauté. I am about to put it in the oven with freshly boiled maple syrup to go along with local trout. Yum! OH MAN!!!! Freshly boiled maple syrup sounds amazing! I bet this will be out of this world with your own maple! Oh that looksmperfectly Roasted. I love the combination of maple syrup and thyme. mmm this rutabaga looks very tasty! I like the fact that this recipe can be prepared quickly and easily. It’s great for dinner for me and my family. Thanks for sharing this recipe! You know, I haven’t cooked much at all with rutabagas, and I also didn’t know they go by swedes outside the US! 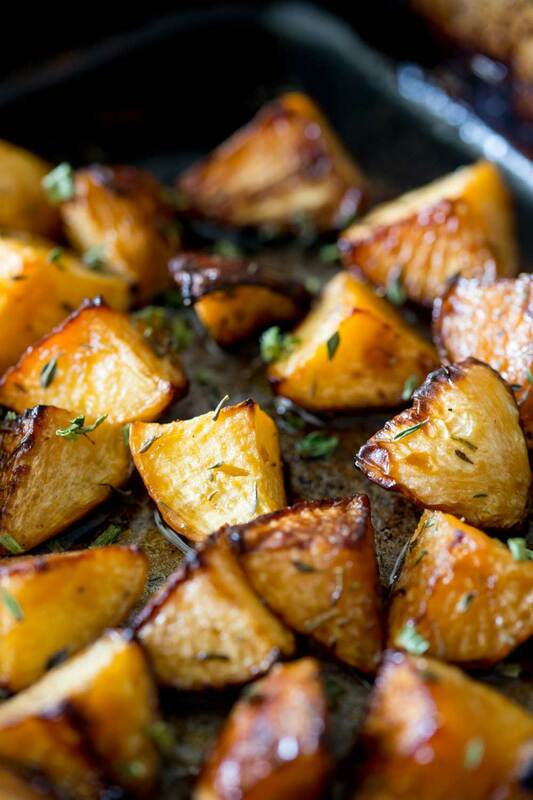 Love this roasted healthier alternative to potatoes with the maple syrup. I have never tried rutabaga before. Could you please let me know what is it and where can I find it? It is a root vegetable Gujan. You can usually find it near the carrots and parsnips in the grocery store. It is yellowy brown and similar shape to a turnip. 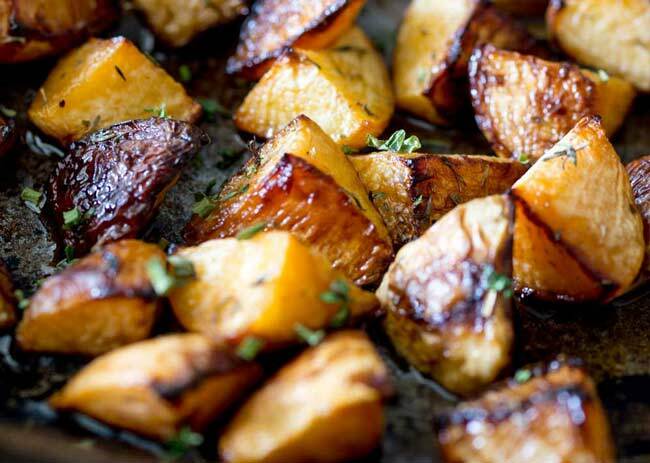 Roasted Rutabaga sounds amazing! My parents produce pure maple syrup on their farm, so we’ll definitely be trying your dish! Bet these flavors would be perfect on fingerling potatoes as well! OH!!! I am super jealous of that Jessica!!!! I want home-made maple syrup! Ooooh it would be fabulous with fingerlings! This is the perfect alternative to potatoes and the seasonings in this recipe are perfect for getting the kiddos to eat them too!! Love!! I agree – rutabagas are under utilized — and that’s too bad, because they’re really delicious. I’ve used them in soups and salads before, but this preparation looks delicious — and fairly easy to do. Will give your recipe a go this week — maybe with a rotisserie chicken. You have such a lovely roast here! I’ve never tried roasting rutabaga before – this looks fantastic – such a perfect char!